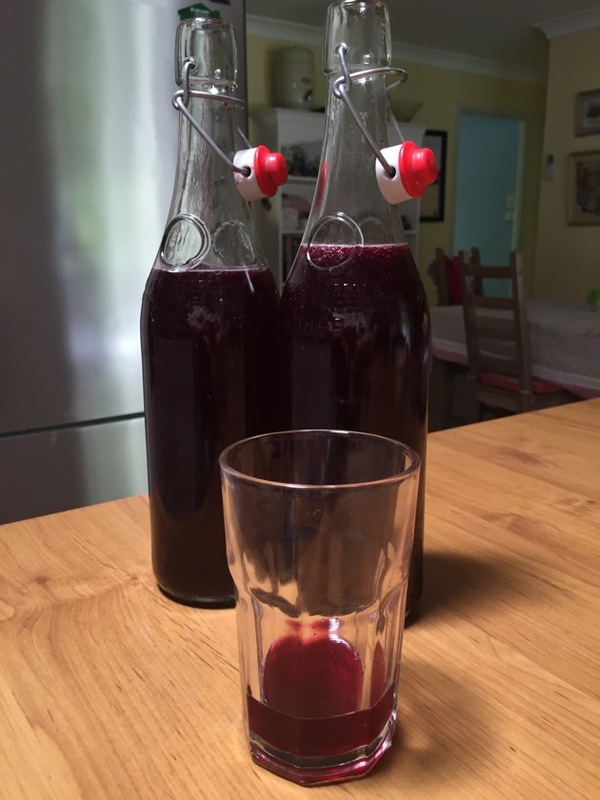 One of the pleasures of a slow summer is having the time to make cordial. Drinking homemade cordial on a hot day is one of joys of the season for us so I make sure our favourites are ready for the hottest days. I love ginger cordial, Hanno loves elderberry cordial, so they are our mainstays. Made with fresh ginger and elderberries from our tree in the backyard, I just add lemon and sugar and that's it. Cordial bought at the supermarket is generally a concoction of water, preservatives, artificial flavours and colours. Making your own is easy to do and a much healthier option. I make up the drink with a small amount of cordial syrup and add cold sparkling mineral water and ice. Hearing those ice cubes clinking in the glass is one of the things I love about summer. 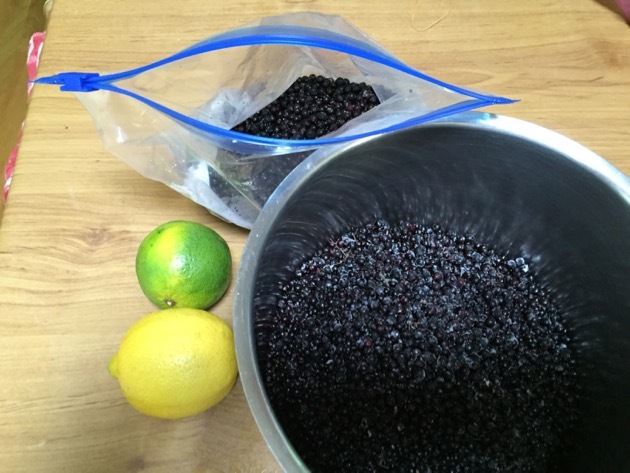 Two bags of elderberries from the freezer, a lemon and lime, water and sugar. That's it. We've been stripping the tree of elderberries for the past couple of months and freezing them. I have a good stockpile of frozen berries now. I want to have the syrup on hand in winter to help us through any viruses or colds we do get. Luckily it's a rare event. 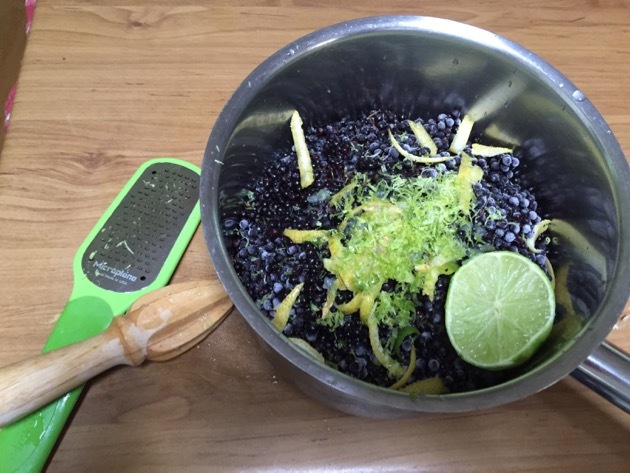 To make the cordial, add the berries with no stems, to a saucepan add the rind and juice of a couple of lemons or a lemon and lime (use whatever you have) and just cover them with water. Bring to the boil, turn down the heat, simmer for 15 minutes and leave the pot on the stove to steep for about 6 hours. Then drain the liquid off through a fine sieve, or a colander with a muslin cloth in it. For every 2 litres of liquid, I add 3 cups of sugar, return it to the heat, and stir until the sugar dissolves. The amount of sugar you add depends on your own taste and how sweet the fruit is. You'll need about this amount of the cordial in a 200ml glass. We fill the glass with cold sparkling mineral water but you could use cold tap water too. Pour the cordial into a sterilised bottle. It will keep for over a year in the cupboard but when you open it, store it in the fridge. 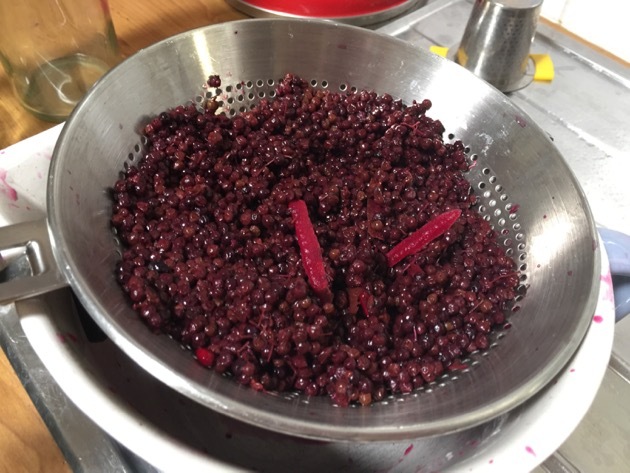 It's easy to make cordial using any fruit you grow in the backyard or if you see summer fruit on special at the shop, grab some and make it up. The cordial will keep perfectly well until you drink it so there's no problem making it up in summer and drinking it much later in the year. You could make cordial using any kind of berry, any citrus fruit, mangoes, pineapple, passionfruit or any fruit that you'll get juice from. The drier fruits, like berries and mangoes, are best cut up, boiled in water and steeped, before adding sugar to the strained liquid. With other juicier fruits, such as citrus, you squeeze the juice and add sugar syrup. Adjust the strength of the sugar syrup according to the taste and type of fruit, and your own taste for sweetness. Normal sugar syrup is 1 kg sugar to 1 litre of water. Weak sugar syrup is 500 grams sugar to 1 litre of water. Juice whatever fruit you have and depending on what it is - the more mellow the flavour, the less sugar you'd add. So, for example, I'd use a normal strength sugar syrup for lemon cordial and a weak sugar syrup for orange cordial. So taste the fruit first and add the amount of sugar you think it needs. Sweet fruit will need less but keep in mind that the sugar not only adds sweetness, it is a preservative too. If you haven't had homemade summer cordial yet, try to find some fruit during the week and make cordial this weekend. It is one of those summer tasks that I'm sure will become a yearly ritual. I don't have an elderberry tree yet, Rhonda. But I need to get one so that I can make elderberry cordial. I wish I had some here today, it would be so refreshing on what is going to be a very hot day! Where are you located Meg? Good morning, Rhonda. My little tree, locally known as Rhonda!s elderberry, has plenty of flowers but no berries thus far. I think nearly everyone in our simple living group now has their own plant from your original one. They certainly grow prolifically. Chel, you can make elderflower cordial too. My tree took about three years before it started producing berries. Before that, the flowers fell off before the berries formed. Oh elderberries, another to add to my list of trees to plant here! I knew there was one missing off my list. And planting thing that have medicinal uses is exactly what Im wanting. Its quite a small tree no? Im sure I have seen photos of it with a seat under it? It's fairly small but it responds well to pruning so we keep ours clipped. Pruning helps produce more flowers and berries. When we had the seat under the tree, it was only a couple of years old. They grow fast. Hi. I live on the Gold Coast, Queensland. I have a long back fence and growing over it are 6 elderberry trees, planted by the original owners over 26 years ago. They were Finnish. Every year the flowers and berries come and I have no idea what to do with them. Do now. Thank you for all the information. Excellent! Yes, the Finns love elder flowers and berries. Elderflower cordial is delicious! Where we lived in the north of Scotland, elder trees grow wild in the hedgerows and I made cordial from the flowers each year. There are plenty of recipes to choose from online. You need to use the flowers when they are fully open and fragrant and before they start to fade. 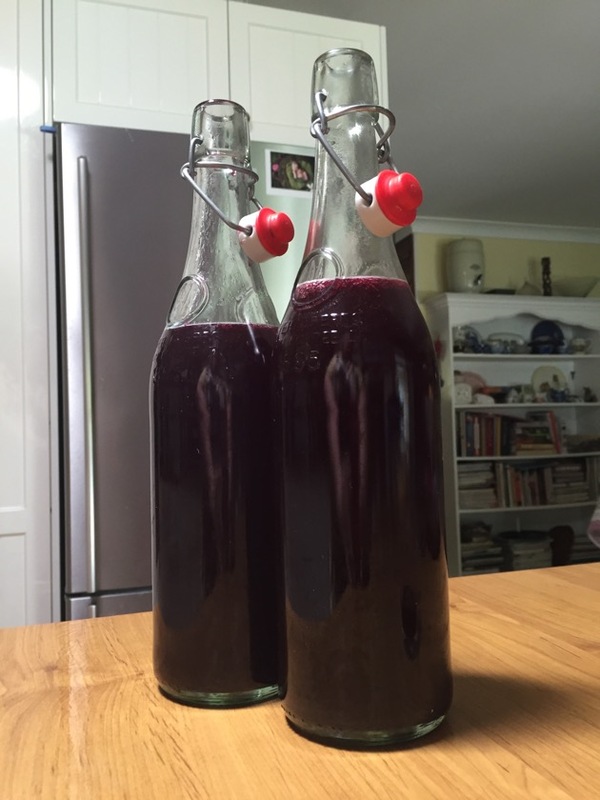 I made two bottles of passionfruit cordial to share with the family over Christmas. It lasted exactly two days! I have been in mango jam and chutney mode for a bit now. I think I might swap over to cordial mode. There's an abundance of passionfruit and lemons up the back that will make excellent cordial. Thanks for the reminder. Good for you Jane. It's a good way of preserving fruit and just imagine having a passionfruit cordial later in the year. It will be such a treat. And lemon cordial in winter is a good source of vitamin c. Win-win! actual I never had cordial. It does sound good. Here in Texas a cordial is made by letting the fruit stew around in alcohol, such as Everclear, then straining it. We used to make cordials out of blackberries. I think your non-alcoholic cordials are a WONDERFUL idea! O I am SO JEALOUS ! I am stuck over here in USA -below freezing and just Drooling over your treasures!! My family loves the ginger cordial - so refreshing. BUT....I have to make two batches, one with peel and one without as there is a staunch division of preference amongst the girls. Mignonne loves the ginger syrup reduced right down till it is very thick and can be poured as a sauce on icecream. Thanks Rhonda. I've pinned this for future reference for when I get my hands on some elderberries. I love making cordial but haven't done it in a while. You have spurred me on...I have mulberries, passion fruit, mangos and lemon juice in the freezer. Hmmm, I think I will be very busy! Love reading your blog. It always makes me feel very peaceful. Thank you. About stems, do you mean the large stems because I see some of the tiny stems in your pot. That is what always freaks me out trying to get the teeny ones off afraid I will poison ourselves. You'll never make up a pot without having a few small stems. They won't hurt you. Use your common sense, take out as many as you can and develop confidence in providing your own food. kirsti, take a photo and ask the folks at the forum to identify it. They'll probably do it quickly for you, or send the photo to me and I'll ask for you.